Wouldn’t it be great if you could clear up your life as fast as you purge your wardrobe when you put your mind to it ? Of course, personal change is no quick-fix and you cannot throw away bad habits, out of date « New Year resolutions » and toxic people in a few easy steps. But the choices you make prior to uncluttering your dresser can be an inspiration for the checklist questions you need to ask yourself if you want to update your mindset – and refashion your life. 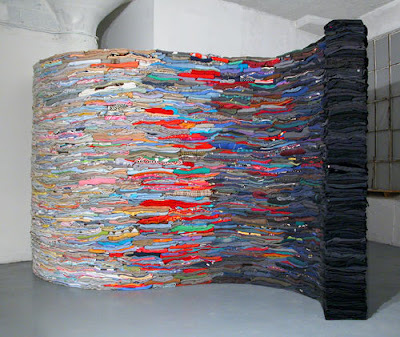 An "S" shaped wall of stacked second-hand clothing, by American artist Derick Melander. The 2,908 individual garments weigh a total of 1,859 pounds. You don’t have to become a feng shui expert (or addict) to find out that clutter can adversely affect your mental well-being, your energy, the overall quality of your life. In the same manner, your emotional clutter adversely affects your physical space. A cluttery house is a fair reflection of your inner turmoil. If your life is at a standstill, if you feel paralyzed by inertia and overwhelmed with problems you have left unaddressed, odds are your drawers and shelves groan under the weight of "stuff". There is no better mirror for both emotional and physical clutter than your wardrobe. Maybe you know the French saying : « Dis-moi comment tu t’habilles, je te dirai qui tu es » (Tell me how you're dressed, I'll tell you who you are). You can easily change it into : "Tell me how you sort out your clothes, I’ll tell you how you sort out your life". How many times have you looked in your wardrobe crammed full of clothes and sighed : "I have nothing to wear" (yes, men find themselves in this predicament too, only they keep it to themselves) ? How many times you looked at your life only to think : "I have nowhere to go ?" Both your wardrobe and the overall quality of your life obey to Pareto’s "80/20 rule" : we wear about 20 per cent of our wardrobe about 80 per cent of the time ; similarly, about 20 per cent of our activities provide about 80 per cent of benefits, rewards and satisfactions. Now this is more of an assumption than a rule, so forget the statistics. The idea is that most of our outputs come from a small amount of our inputs. Back to the wardrobe situation, does this mean we simply need to identify the clothes we wear most of the time and throw the rest ? Not so fast. The tricky thing with clothes is that the outfits we wear most often are not necessarily those which suit us best and make us shine. Only we don’t notice it anymore… The same happens with our life. For instance, some activities or decisions provide a short-term or apparent benefit but have hidden costs and make us unhappy in the long run. Only, for some reason, we fail to notice the cause-effect relationship. This is why, when you decide to refashion your wardrobe, you need to proceed wisely. Don’t rush. Before throwing 80 per cent of your outfits in bin bags, run each item through this five-point checklist to determine if it is a must-have… or a must-go. And why. By identifying the root causes of your present predicament you will learn how to avoid it in the future. This same checklist will help you to identify the unseen causes of your emotional clutter. In both cases, don’t expect immediate results : uncluttering is just the first step towards downsizing your wardrobe and upsizing your life. 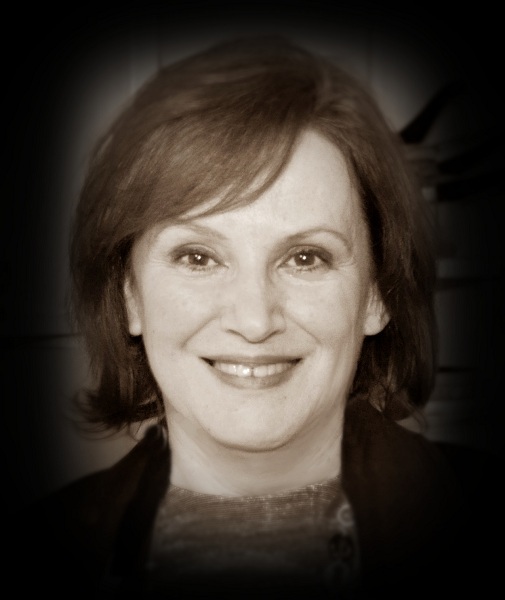 Go to Part II : Clear up your wardrobe and your life : identify the intruders. Hello, I am one of your website customers. I want to thank you for all your post and particularly this post on your website. You are doing the best job. And I wish you good luck.